To claim this profile, please confirm you are Marissa Retzlaff. To follow this profile, please let us know your relationship to Marissa Retzlaff. RESULTLoss Girls varsity basketball vs. Bethlehem. The Central varsity basketball team lost Tuesday's home tournament game against Bethlehem (Bonifay, FL) by a score of 27-23. The Central varsity basketball team lost Friday's home non-conference game against rival school Jay (FL) by a score of 52-32. RESULTWin Girls varsity basketball vs. WFBA. The Central varsity basketball team won Tuesday's home non-conference game against West Florida Baptist Academy (Milton, FL) by a score of 44-39. RESULTLoss Girls varsity basketball @ Bethlehem. The Central varsity basketball team lost Friday's away conference game against Bethlehem (Bonifay, FL) by a score of 53-51. RESULTWin Girls varsity basketball @ Gulf Breeze. The Central varsity basketball team won Thursday's away non-conference game against Gulf Breeze (FL) by a score of 35-29. RESULTWin Girls varsity basketball vs. Malone. The Central varsity basketball team won Friday's home non-conference game against Malone (FL) by a score of 44-27. RESULTLoss Girls varsity basketball vs. Paxton. The Central varsity basketball team lost Tuesday's home conference game against Paxton (FL) by a score of 50-16. RESULTWin Girls varsity basketball vs. Gulf Breeze. The Central varsity basketball team won Monday's home non-conference game against Gulf Breeze (FL) by a score of 49-37. Marissa's basketball stats have been updated for the win @ Malone. RESULTWin Girls varsity basketball @ Malone. The Central varsity basketball team won Friday's away conference game against Malone (FL) by a score of 43-20. Marissa's basketball stats have been updated for the win @ Laurel Hill. The Central varsity basketball team won Thursday's away conference game against Laurel Hill (FL) by a score of 78-60. Marissa's basketball stats have been updated for the loss vs. Ponce De Leon. RESULTLoss Girls varsity basketball vs. Ponce De Leon. The Central varsity basketball team lost Tuesday's home non-conference game against Ponce De Leon (FL) by a score of 64-30. Marissa's basketball stats have been updated for the loss @ Jay. The Central varsity basketball team lost Saturday's away non-conference game against rival school Jay (FL) by a score of 54-36. Marissa's basketball stats have been updated for the loss @ Poplar Springs. RESULTLoss Girls varsity basketball @ Poplar Springs. The Central varsity basketball team lost Friday's away conference game against Poplar Springs (Graceville, FL) by a score of 37-27. 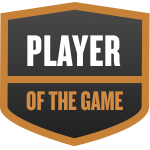 Marissa was selected the Player of the Game in the basketball game against West Florida Baptist Academy on Tue, Dec 18 2018.